officially in the Fall season. I didn't use to like Fall much. Too close to winter I guess. are the signature of Fall. Now, well, I love it almost as much as Spring! stink out as my dad use to say. And I love partying with all of you the best! Carol shared her Fall entry. I just love how she decorated her mirror. using burlap anytime of the year! I buy it buy the yards myself. button Carol and wear it proudly! Click on the image above to learn, and earn, more! Congratulations on the wedding. Very exciting. Have a great week! Are you looking for original content or could it be something we've already posted on our blogs? THanks so much Kathe for another great party! Thanks for hosting the par-tay! Have a great day! Thanks for hosting Kathe, always a pleasure to join and as well as check out a great group of posts. Hi Kathe, thanks for hosting. Lots to read. Hi Kathe, Congrats on the upcoming wedding for your son. I would have loved to have been a guest host, but I will be in big beautiful Hawaii. Thanks for hosting and I love the feature! Congrats on your son's wedding! How exciting! I will be thinking about a project I can do. Thank you so much for hosting!! Have a wonderful week. Congratulations to your son....exciting time for all. Thanks a bunch, Kathe, for featuring my entry table this week! It made my day! What a fun party and a beautiful blog! 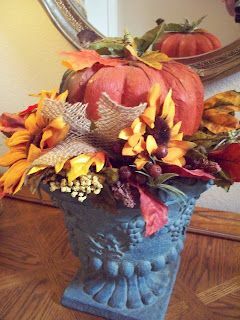 I love all of the great Fall decorating ideas everyone is sharing! I'm linking and I'm a new follower! Enjoy your day and thanks! Thank you so much for visiting me and letting me know about your "You're Gonna Love it Party". I have joined in on the fun this week. Also I have become your newest follower. Now I'm off to visit some of the party goers. Hi Kathe, Great party! Have a wonderful week. Hi Kathe! I found your blog through Natasha in Oz. I've just linked up my Joyful Poetry and Flower Photography in spot 92. I've Tweeted about the hop and I'm now following you with GFC. I'm late for the party, but I made it! I'm sooo far behind this week! eeek! P.S. I LOVE your Fall Hutch!